The holidays are fast approaching for many people and we all want it to be a great time. 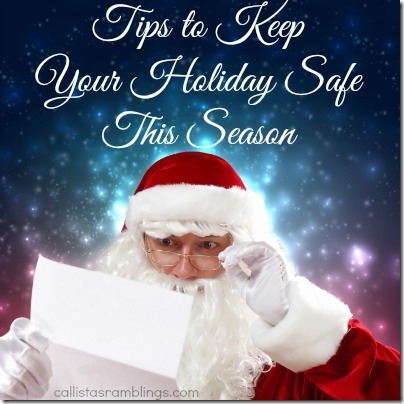 Taking a few safety precautions will help ensure and safe and happy holiday for all. Keep them out of reach of children and away from pets, tree decorations and wrapping paper. Use sturdy candle holders so they won’t tip over. Make sure the tree is well-secured in a sturdy stand. Place tree away from sources of heat such as heating vents, stoves, fireplaces etc. Keep sharp or breakable ornaments away from young children. Choose tinsel and other trimmings made of plastic or non-leaded metals. Don’t let children put decorations in their mouths, as some may be harmful to their health. Replace broken or burned out bulbs right away. Check light strings and extension cords you use. Do not use if they are frayed, have exposed wires or broken light sockets. Turn off holiday lights before you go to bed or leave your home. Choose gifts that are suitable for your child’s age group. Read and follow all instructions for any new toy. Make sure batteries are not accessible to children and are properly installed by an adult. Dispose of packing materials such as plastic bags and Styrofoam pieces immediately. Cook food thoroughly to a safe internal temperature and serve it promptly. Use warming trays or crock pots to keep hot foods hot. Put serving trays on crushed ice to keep cold foods cold. Throw away any food left out at room temperature for more than 2 hours. Store all leftovers separately, especially turkey, stuffing and gravy. Use refrigerated leftovers within two to three days or freeze right away for later use.